Long associated with American Wild West, the American Bison is one of the most iconic species found throughout the Americas. With males capable of reaching over 2,000 lbs (the heaviest recorded individual weighed a massive 2,800 lbs), the species is the largest land animal found throughout the ‘New World’. The American bison is infamous for the massive herds that once roamed across the Great Plains of North America. At their peak (Pre-1800), it is estimated that somewhere between 30 and 60 million individuals were present throughout the region. This massive population size would have put the species as one of the most numerous large mammals on earth at the time. Plains Indians, which are Native American tribes located throughout the Great Plains, have a historic association with the Bison. Many tribes considered the species sacred and relied on the Bison as a source of food, clothing and raw materials. When hunted by these tribes, all parts of the Bison were utilized and it is unlikely that hunting by the Plains Indians would have had a significant impact on population dynamics. Almost as infamous as their once massive population size is the catastrophic population collapse endured by the species throughout the 19th Century. While traditionally hunted by the Plains Indians, it was not until the westward migration of the European-American settlers that Bison were harvested in such massively unsustainable numbers. As the European-American settlers began to move West, they encountered some resistance from the Plains Indians. Aiming to reduce the ability of the tribes to resist, the settlers undertook a mass slaughter of Bison herds. The settlers viewed Bison as ‘in endless supply’ and hunted them for their meat, hides and bones (once the carcasses rotted, the bones were processed into fertilizer). Towards the close of the 19th Century (1889), 1,091 Bison survived throughout North America. Of these surviving individuals, 85 (8%) were considered ‘free-ranging’ and within the borders of what is now the United States. Another 200 (18%) were present in the federal herd located in Yellowstone National Park. Individuals in both zoos and private herds numbered 256 (24%), while another 550 (50%) individuals survived at Great Slave Lake in Canada. Yellowstone National Park, which is mainly located in the State of Wyoming and extends into both Montana and Idaho is the only place in the Lower 48 States in which truly ‘wild’ Bison (unfenced and not crossed with domestic cattle) have continuously existed since pre-historic times. In the remote Pelican Valley of Yellowstone National Park, approximately 1,000 individuals escaped the mass slaughter that occurred throughout the 19th Century. By 1889, this number had been reduced to 200 due to continued hunting pressure. By 1902, this herd was further reduced to a mere 23 individuals despite efforts by the American Military to prevent poaching. Besides these 23 animals in Yellowstone National Park, 700 survived in private herds which made up the entirety of the American population. It was at this point that the species was afforded greater protection from hunting and it was this, combined with the establishment of several private herds throughout the country that saved the species from extinction. 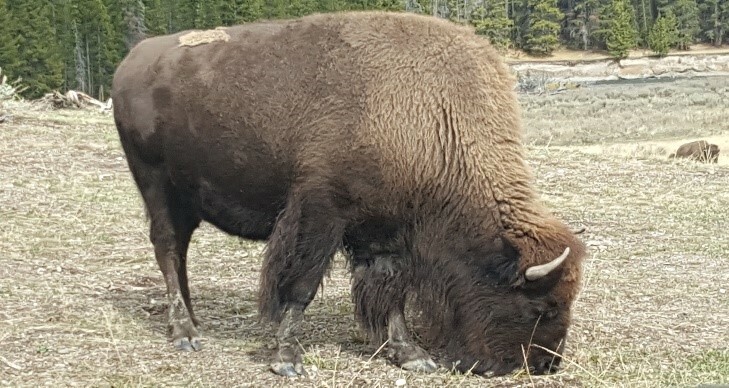 To preserve the genetic integrity of the Yellowstone herd, several individuals were translocated from private herds and gradually interbred with the remaining Yellowstone Bison. Today, it is estimated that about 500,000 American Bison exist throughout North America. Most of these however, cannot be considered ‘pure’ Bison as they have been, at some point or another, crossed with domestic cattle. Of these 500,000, 30,000 (17%) exist in conservation herds while 15,000 (8%), can be considered truly ‘wild’ and survive in unfenced areas. While the recovery of the American Bison is considered one of the greatest conservation success stories throughout the Americas, increasing population size has resulted in the appearance of several conflicts in and around the Yellowstone area. While Yellowstone is home to several predator species such as; the Grizzly Bear, American Black Bear, Wolf, Coyote and Cougar, the size and strength of the American Bison means that predation pressure is relatively low, especially when compared to other prey species such as Elk. While both Grizzly Bears and Wolves are capable of preying on Bison (in general, predation is limited to calves and old/sick individuals), predation does not occur at such a level as would impinge on population growth. Because of this, along with the fact that the species is afforded strict protection throughout Yellowstone National Park, the population continues to grow at a rate of between 10% to 17% per year. As of 2016, there are an estimated 5,500 individuals surviving throughout Yellowstone National Park. It is believed that Yellowstone National Park can support between 5,500 and 7,500 Bison. However, during the winter months, when food is scares, Bison tend to migrate to lower altitudes and in some cases, outside the boundaries of the park and into the State of Montana which brings them into conflict with cattle farmers. One of the main conflicts associated with increasing Bison numbers is the species’ ability to carry Brucellosis, a bacterial disease which can cause abortion and premature calving in domestic cattle. Brucellosis is classified as a zoonotic disease, meaning that it can be transmitted from animals to humans by consumption of undercooked meat and/or unpasteurized milk. As Bison numbers increase, so does the likelihood that individuals carrying Brucellosis will come into contact with domestic cattle while foraging outside of the park during the winter months. It should be noted however, that there is not a single reported case of Brucellosis being transmitted to domestic cattle from wild Bison. 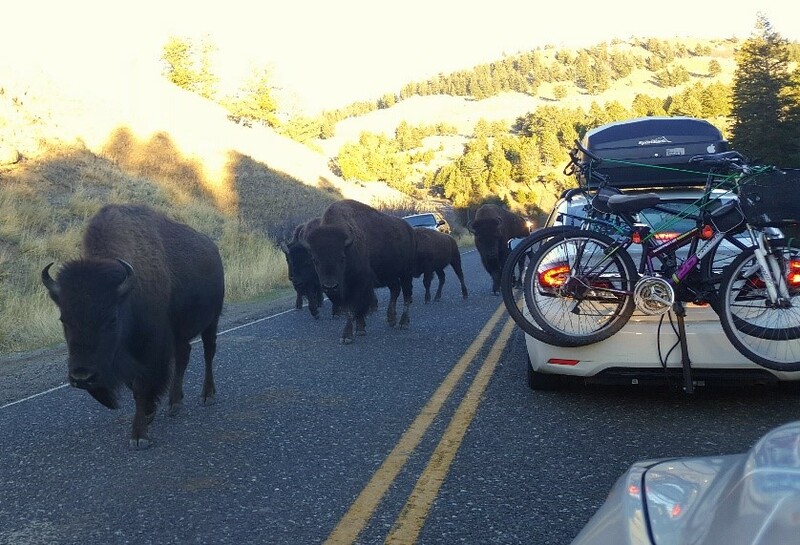 Traffic in Yellowstone regularly comes to a standstill because of Bison on the road. Photo by Jamie Ellis. Due to the threat of Brucellosis, Bison do not move unimpeded throughout the State of Montana. In some cases, Bison are scared back in the direction of Yellowstone using guns. Hunting is currently permitted outside Yellowstone and around 300 individuals are shot annually. This number however, can fluctuate as the number of individuals shot is correlated to the number of individuals that forage outside of Yellowstone. In an effort to mediate this conflict, Yellowstone officials have organized several culls throughout the years. During the winter of 2016/2017, there are plans to cull between 600 and 900 (18%) individuals which will be the largest cull since 2008. While these culls have proved controversial with the public, translocation is not currently a viable option due to the Brucellosis controversy and the fact there are not many areas willing to accept Bison. In recent years, public tolerance in regards to Bison has increased. Throughout the State of Montana, several ‘buffer’ areas have been created. These are areas in which the Bison are tolerated during the winter months. In Yellowstone, the aim is that a population of 3,000, which fluctuates between 2,500 and 4,500 will be established. Officials also hope to eventually phase out culling and to solely rely on hunting (outside the boundaries of the park) to control bison numbers. Jamie has a BSc in Zoology and a MSc in Wildlife Conservation and Management. He has volunteered on conservation projects in both South Africa and New Zealand and worked for a year in the South of France on a project aiming to increase the breeding success of the European Roller. Always great to read a positive conservation story- especially when there’s so many negative ones around. Looking forward to your next one.